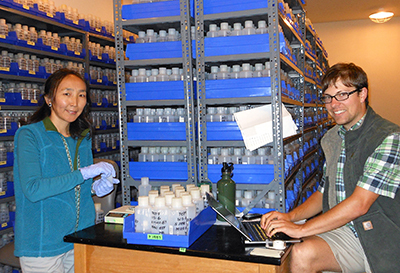 Tamir Puntsag, left, and Geoffrey Millard work on water samples at the Hubbard Brook Experimental Forest in New Hampshire. Rising temperatures worldwide are changing not only weather systems, but - just as importantly - the distribution of water around the globe, according to a study published today (March 14, 2016) in the journal, "Scientific Reports." Analysis of more than 40 years of water samples archived at the Hubbard Brook Experimental Forest (HBEF) in New Hampshire tells a vivid tale of how the sources of precipitation have changed. Over the years, there has been a dramatic increase, especially during the winter, of the amount of water that originated far to the north. "In the later years, we saw more water derived from evaporation of the Arctic and the North Atlantic oceans," said Tamir Puntsag, a graduate student at the SUNY College of Environmental Science and Forestry (ESF) in Syracuse, New York, and the lead author on the study. This study marked the first time scientists have used specific measurements to demonstrate how water sources are changing, especially in the northeastern United States. "Climate change has an important relationship to the water cycle. It goes beyond temperature effects," said co-author Myron Mitchell, an ESF biogeochemist/ecologist who is Puntsag's major professor. "This study shows how climate change is altering the spatial patterns and amounts of precipitation - where it comes from and where it falls. Such effects can drastically affect the availability of potable water and also contribute to the massive flooding we have seen in recent years." "Scientific Reports" is an online journal from the publishers of "Nature." Other researchers involved in the study were John L. Campbell, a former doctoral student of Mitchell's affiliated with the U.S. Forest Service Northern Research Station in Durham, New Hampshire; Eric S. Klein of the University of Alaska Anchorage, Biological Sciences Department; Gene E. Likens of the Cary Institute of Ecosystems Studies in Millbrook, New York; and Jeffrey M. Welker, also of the University of Alaska Anchorage. As record warmer temperatures in the Arctic cause dramatic decreases in the depth and coverage of sea ice, the Arctic vortex (often called the polar vortex) has become less stable, occasionally spilling frigid air onto the eastern United States, such as occurred in October 2015 and February 2016, when areas from New York to Miami experienced record cold. The altered circulation of moisture in the atmosphere drives changes in the global water cycle, causing, for example, Arctic water to fall as rain or snow in New Hampshire, some 2,500 miles to the south. Mitchell said the findings of the study will help scientists understand changes that are likely to affect global water resources. With 85 percent of the world's population living in the driest half of the planet and 783 million people living without access to clean water, according to the UN, it is vital for scientists and policymakers to understand how a changing climate affects water resources. "Our research helps our understanding of the sources of rain and snow and how these precipitation patterns have changed. Our study also sheds light on what is going to happen to water resources in the future," Mitchell said. "This is another clear indication that climate change is happening and we're seeing evidence of it today. If we are going to understand how water and temperature interact, it is important to understand how climate change, including alterations in the water cycle, affect us locally, regionally and globally." Puntsag used isotopic analysis (identification of the structure of the atoms that make up a substance, such as water) to develop a story of the water's travels. Water always contains two atoms of hydrogen and one atom of oxygen but its isotopic composition can vary from one water source to another. Puntsag also used mathematical models to trace the sources of these water sources in precipitation at the HBEF. She examined samples collected weekly between 1968 and 2010. This research is part of her doctoral program in water and wetland resource studies. An international student from Mongolia, Puntsag arrived at ESF as a Fulbright Science and Technology scholar, and her work has also been funded by the National Science Foundation (NSF). She gathered data through painstaking analyses of archived samples that had been collected weekly as part of the NSF's Long Term Ecological Research Network.